Congratulations on your acceptance to WSU Spokane! Thursday, August 15 | 8:30 am-3:00 pm. | Academic Center | 600 N Riverpoint Blvd. Chart your course for success and learn all that WSU Spokane has to offer. You will get connected with your peers, learn about campus resources, and find out how to get involved in campus life. 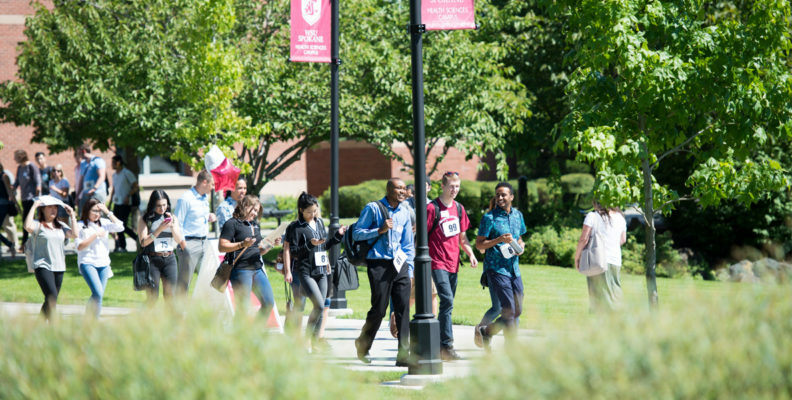 ALL NEW students to WSU Spokane will be signed up for Campus Orientation. Plan to arrive on campus by 8:30 am to check-in. Expected dress is casual with comfortable shoes. The Office of the Registrar at WSU Health Sciences Spokane is located within the Student Affairs Office, Spokane Academic Center, Room 130C. It is open during business hours Monday through Friday. Congratulations on your acceptance to Washington State University Spokane! The staff of the Student Affairs Office wants to welcome you and looks forward to assisting you during your educational experience at the University. We value your contribution to the campus community, as we will learn from each other by sharing ideas and cultural heritage. We encourage you to seek out opportunities to learn about the U.S. culture as well as teaching others about your background and society. See more. LOG INTO myWSU and review any checklist items. KNOW the deadlines for tuition payments and late fees. SIGN UP for WSU Emergency Alerts. CHECK OUT Campus Parking Options. In addition to Campus Orientation, each program hosts an orientation specific to your degree program during the week of August 12-16. Please contact your academic department if you have questions or need more details.